Despite scoring two goals in the second half against No. 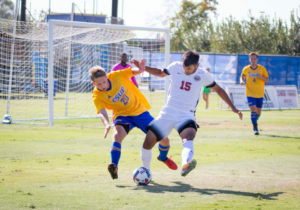 19-ranked Loyola Marymount University, the CSU Bakersfield men’s soccer team fell just short as it lost 3-2 at home on Friday. 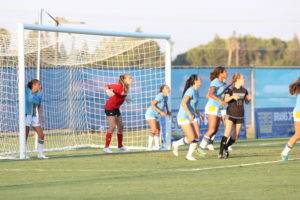 LMU got off to a quick start by scoring its first goal in the 14th minute on a free kick from sophomore forward Alvarado Madrigal. 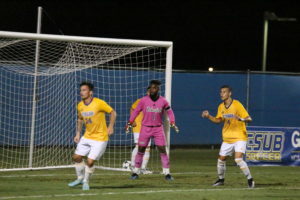 The Lions (5-0) added another goal in the first half, however, this one came in the 39th minute off two touch passes from sophomore forward Maurice Morton and redshirt-freshman defender John Bovill to sophomore midfielder James Tanaka who put it in the back of the net. However, the Roadrunners (1-2-1) responded early in the second half with a goal from senior forward Simon Doherty, which was assisted by redshirt-sophomore forward Daniel Dreier. That was also the first goal the Lions have given up all year and the first since Nov. 9, 2014. 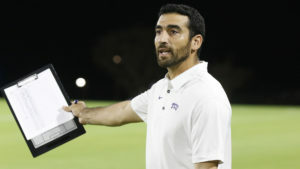 LMU responded with a goal of its own in the 74th minute from freshman midfielder Miles Chow to give the Lions the cushion they needed because in the 86th minute senior midfielder Christian Duarte cut the lead on a penalty kick. 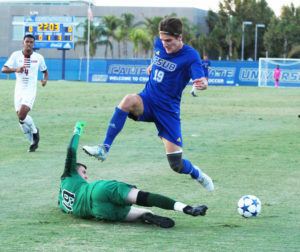 With two minutes left, the Roadrunners had one last chance to tie the game on a shot attempt from redshirt-sophomore forward Julian Zamora but LMU’s senior goalkeeper Paul Blanchette stopped the threat. 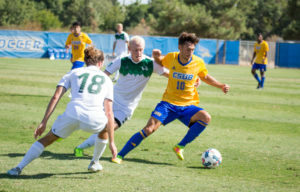 CSUB is scheduled to play next at CSU Northridge on Sunday at 6 p.m. 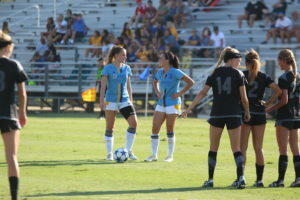 The Roadrunners’ next home game will be on Oct. 4 against the University of the Pacific at 4 p.m.